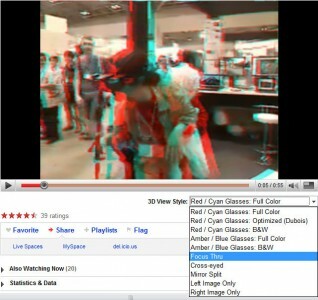 YouTube is experimenting with 3D videos in the site. You can use red-cyan glasses or you can just cross your eyes. Not the best method, but it works. You can read a bit more about it on the YouTube forum and and different 3D techniques on Wikipedia.org. To watch the videoes bellow with 3D effect, cross your eyes. To watch it with other 3D techniques, you have to click the links bellow the video to go to YouTube and choose other options.